We sang this old hymn in church this morning. The tune is simple and the words are simple, a humble song of gratitude. As I sang it, I was so filled with appreciation for my life, for all the blessings that pour down on me like gentle showers of flower petals. As I walked home, I could feel the warmth of the spring sun on my face, the bees were humming in the trees, birds were chirping with twitterpated glee. What a glorious day. I don’t think where we sing our songs of gratitude is important. I don’t think the words are important. More than anything, I think what matters is that we look around us at the bountiful miracles of every day and sing a song of thankfulness. No matter where you are today or what you’re doing, I hope you are feeling appreciative and appreciated. Blessings to you, my friend, on this magnificent day. The realtor pulled up in front of a house with a for sale sign. We almost missed it. I had asked her to take me back to the hotel after a frustrating and demoralizing afternoon. I was still jet lagged after having arrived back in the United States the day before, and I was getting a headache. But as she passed a cross street in the older neighborhood we were touring, I saw the for sale sign down the block and suggested she circle around for a look. Until that moment, I was questioning my decision to move to Portland, Oregon. I had been living and working overseas for seven years. My adventure had taken me to three countries on three continents, but it was time to come back and I was eager to settle down. Only a few days earlier, the representative from the moving company had stood in my apartment in Paris, asking where to send my things. I didn’t know. Memphis, where I grew up, no longer felt like home. I didn’t know where home was anymore. I felt lost. In what can only be called a leap of faith, I named the city that had been on my mind for months, although I had never seen it.. But when I arrived in Portland, nothing felt right. The first houses the realtor showed me might as well have been on another planet. I questioned my sanity. And then, there it was. A small tudor style home with leaded glass windows, nestled in between two bigger homes on a quiet block with trees overhanging the street, and rusted iron rings still embedded in the curbs to tie up your horses. As soon as I saw it, I knew it was home. I could see myself walking up the front walk at the end of the day, happy to be home. I could see my son, who had just turned four, riding his bike and playing with the kids I saw. No one was living there, so we were able to go right in. As we stepped inside, I felt the loving warmth that breathed from the floors and walls. The house was in an estate sale and was still furnished with sweet, old fashioned taste and happy family pictures. I found out that the house had had only one owner. Built in 1937, it was the first home of a young couple who moved in and raised their son. The wife, widowed and her son long grown and gone, continued to live there until she died. Nothing in the house was updated. It was an electrical and plumbing museum. Clothesline was strung up in the basement for drying. There was no dishwasher or garbage disposal. It didn’t matter. I was in love. I bought the house that night. Over twenty years later, it is still my home. My five children have grown up in it. I almost put it on the market when the third child came along, but I knew someday the kids would leave and this is where I wanted to be. So the kids shared rooms, and we all made do. Someday, I know my time in this house will come to an end. I hope when that time comes, someone will pull up in front of the house and recognize it as home. They will walk in the door and feel the love that has permeated the plaster and seeped into the hardwood floors for decades, perhaps even a century by then. I hope I have honored the legacy of the woman who left her blessing in the home for me, as I will leave mine for those who come after. On my last post, several people commented about my learning nunchucks. If you want to know more about that, you might enjoy this guest post I wrote for Barbara Torris at Retire in Style. When I tell people I have a black belt in taekwondo, they are, not surprisingly, surprised! I just turned 60 and I’m a grandmother twice over. My hair is gray and my skin has seen better times. And yet, there I am, out there kicking and yelling with people much less than half my age. And loving it. How did this come about? Click here to read the rest. What is it that I’m shedding? I think back to when the sensation began. What was happening then? One thing was that I decided to stop a spiritual study I was doing with someone I like very much. I like talking to people of faith, any faith, which includes everyone if you think about it. Even people who claim to have no faith have faith in its absence. I’m curious about what faith means to people, how faith guides them, how it manifests in their everyday lives. So I enjoyed my discussions with this person. It became clear, however, that we were reaching a point where I was being asked to make a choice, to commit to her view of things, to join her community of faith. I felt sad about this because, as I had explained to her before, I already have a community of faith I am committed to, and I don’t plan to leave it. I also felt a bit flummoxed because declining her invitation seemed like a rejection of her beliefs. By her definition, it was, although I didn’t see it that way. A spiritual koan. Another thing that was happening involves my recent interest in learning how to use nunchucks, a martial arts weapon made of two sticks joined by a chain. In the first lessons, the teacher showed me specific techniques, but there came day when he turned me loose, so to speak, to use the techniques in any combination I wanted, and furthermore to experiment with other techniques. I was initially paralyzed by the absence of specific instruction, but once I embraced the concept I found great freedom in letting the nunchucks fly, keeping them in motion without a lot of thinking and planning. When practicing privately, I discovered that closing my eyes and just feeling them in my hands enhanced both my ability and enjoyment. What could these things have in common and how could they be connected to this sense of falling away? I’m not sure, but I keep going back to that passage from the Tao Te Ching quoted above. As a person who has spent waaaaay too much of my life living in my head, naming I’m sure ten thousand things and more, I’ve come to a place where the naming just doesn’t seem so important anymore. I don’t seem to crave that in-my-head rational clarity the way I used to. Yes, we understand our world by naming it and explaining it, and communication requires common agreement on the meaning of certain words. But somewhere beyond that, or beneath it or inside it or over the rainbow (see what I mean about words? ), all the names fall away. And the mystery itself is the doorway to all understanding. Is that spelling a coincidence? I don’t think so. I’m looking at my old dog sleeping on the couch next to my computer table. Sadie’s face and paws are white with age. She has fatty lumps under her skin, and unattractive moles around her eyes. The teeth she has left are stained and her breath is bad. She is deaf as a post, and that makes her skittish, so she barks a lot. But her voice is damaged, and her bark sounds more like a soft, hoarse woof. When she gets up, her back legs are stiff and she sometimes falls. Her digestive system is, shall we say, delicate. I think back over fourteen years of her companionship. She has been my constant buddy, even going to work with me many days, where she would sleep under my desk by my feet or wait patiently by my office door for me to take her for a walk in the park next to my building. At night she sleeps with me. She starts the night at the foot of the bed, but during the night she gets cold, so she leans over me like Snoopy and pokes me with her paw until I lift up the covers and she scoots under, curling up behind my knees where I’m sure she will suffocate, but she never does. I think back to her puppy days, when my children were people puppies. My daughter would dress her up and put her in the doll stroller. Sadie would look at me with mournful eyes as I laughed and took photos. James would dance with her. She was happiest when we were all at home. She always had a person to lean up against, confirming the description of her breed as Velcro dogs. I’ve not always been as good to her as she has been to me. There have been days too cold or rainy for my liking, so the leash remained on top of the refrigerator. There have been times when the ball dropped by my feet repeatedly has just as repeatedly been ignored. There have been times when I impatiently hurried her along when smells too wonderful to believe beckoned from the foliage. And yet she has never turned her back on me. She has never been cranky or irritable. She has never ignored my overtures of affection. She overlooks my shortcomings and dismisses my imperfections. She is always glad to see me and is always sad to see me go. As many times as I have failed her, she has forgiven me, without hesitation and without asking for an apology. She never brings up my past transgressions. Her forgiveness is as pure and generous as a child’s. Without judgment or complaint. She reflects back to me a vision of myself as lovable and loved. What could I possibly have done to deserve such grace? Nothing. *This only works in English. Please note that I will be away from my computer for a long weekend, so I hope you will excuse any delay in publishing your valued comments. How I wish I could take credit for that clever post title. Alas, I can’t. However, I can tell you about the book I just finished reading by that title, authored by Drs. George Pratt and Peter Lambrou, with John David Mann. The inspired title refers to the four-step program and five pathways they developed to bring more joy into their patients’ lives. Let’s face it. 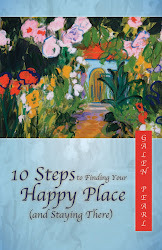 There are lots of books and blogs out there about happiness. That’s what this blog is about, after all, and I’m working on a book to add to the already overcrowded shelves devoted to this topic. So why do we keep reading and writing about joy? Because, I think, it’s what we all want. Luckily, the very act of focusing on happiness, through reading, talking, thinking, or writing, seems in some way to contribute to its discovery and enhancement. And ultimately, regardless of our path through faith, science, meditation, exercise, or any number of “steps,” we all end up at the same place, although we might use different vocabulary to describe it – in the present moment, connected to each other and to the universe. So it is with Pratt and Lambrou, both clinical psychologists, who, through extensive study of a wide spectrum of research as well as their own clinical observations, have distilled a simple and immediately useful process for identifying and clearing out habitual limiting thought patterns, and substituting new and healthier thinking habits. This is very much like what I call giving ourselves permission to be happy, by substituting counter beliefs for the shadow beliefs that block our joy. They go on to add methods by which the new thinking habits can become a solid and permanent foundation for our lives, the “and Staying There” part of my blog title. Their process is grounded in cutting edge knowledge about the neuroplasticity (my new favorite word) of our brains. Contrary to the conventional wisdom that our brains get permanently and irrevocably hard wired at a young age, it turns out that you can indeed teach an old dog new tricks. That is, you can transform some of those early “imprints” that do not serve your well being in your life now, by building new neural networks that do. This is great news if your brain, like mine, has seen its younger days fade into the distant wake. My own experiences fifteen years ago of transforming my life from one based in fear to one based in joy bear out the truth of their assertions. Interestingly, the book that most reminded me of Code to Joy was not another one of the psychology/science books on joy, but rather The Joy of Living, a book by Youngey Mingyur Rinpoche, a Buddhist teacher who blends similar modern scientific research with ancient wisdom of meditation. This is best reflected in the following passage from Code to Joy. A Course in Miracles teaches that fear comes from our mistaken perception of separation. All the limiting beliefs identified by Drs. Pratt and Lambrou are in some way based in this fear. Using the simple techniques in this book, we can correct that mistake and reconnect with the joy that always shines in our souls. And if I didn’t already like the book, they sold me by using one of my favorite quotes from Star Trek. Remember the Borg’s fateful announcement? “Resistance is futile.” The authors use this in the sense that although it is futile to resist our habitual brain patterns, it is entirely possible to transform them, a premise with which I entirely agree. Besides, anyone who quotes Star Trek as an authority is okay with me. I’m delighted to present this guest post by Bob Lowry, who writes Satisfying Retirement. Although Bob’s blog focuses on all aspects of leading a fulfilling life in retirement, I read his blog long before I retired because I found that much of his wisdom applies to life at any stage. We want control...control of our life, our future, our health, our time, our relationships, even our thoughts. Being in control means what we want to happen will. So, we go through our day believing the force of our personality or intellect, or some cosmic plan will insure the outcome we desire. We are part of a culture that preaches we determine how we live. It is all about my needs and me. Unfortunately, life doesn’t work that way. Thinking we are in control and believing our needs alone determine what will happen is an illusion. When suddenly something happens that forces us to recognize our life is not unfolding the way we expect, we are faced with tension and anxiety. A major health emergency, the loss of a job, the failure of a relationship, or financial plans going awry are part of living. Suddenly, there is a strong lack of certainty over our decision-making. Our life seems to lack consistency: we don’t have a sense that today will be like yesterday or tomorrow. Does that mean it is best to simply accept whatever comes your way? Is it silly to make plans or set goals? Absolutely not. Being happy may not mean you control everything that happens in your life, but you certainly can influence it. You can prepare for change and learn to adapt to what happens. What can we realistically hope to control? Our attitude and reactions are two major elements under our influence. As Galen has made abundantly clear in this blog, what we think about in large part determines how well we are navigating the ten steps to happiness. Then what are some ways we can take to understand the true meaning of control? You can’t control other people. Even your children or grandkids will only follow some of what you suggest is best for them. What you can do is control how you react to whatever that other person is doing. In some cases you may find it is best to simply spend little or no time someone whose actions leave you continuously upset and agitated. If you are faced with a major problem, break it into smaller pieces. You are much more likely to be able to control how something unfolds if you deal with each smaller part of a situation, one at a time. Look at the issue causing you concern with a fresh perspective. If controlling its effect on your happiness and contentment is not possible, you can decide to make it less important in your life. You can control how much time or energy you invest in worrying about it. Place it lower on your priority list. Understand you are not alone. If you are a religious person, you already understand that God has ultimate control over the world and what is happening. It is very liberating to give up what is troubling you when you accept that a power much greater than you is actually in charge. Your burden is not yours to carry alone. Having friends to lean on helps tremendously. Sharing your frustrations and hurt with someone else who cares deeply for you is very cleansing and empowering. Your friend’s empathy lets you see that you matter and you are loved. Acceptance of how the world works, and even your ability to be happy, comes from understanding one very basic fact of being a human being: there is a critical difference between believing you are in control and understanding that only some things are controllable. Wisdom is grasping the difference. Happiness is accepting it. Bob Lowry writes the blog Satisfying Retirement. He is the author of Building a Satisfying Retirement available through Amazon and is a contributor to the new book, 65 Things To Do When You Retire. Bob and his wife live in Scottsdale, AZ. Well, actually it’s about a lovely evening I spent recently in the company of several people from Haiti. One was one of my taekwondo instructors. His brother, a businessman, was also there. Three were martial artists visiting from Haiti to compete in championships. (One of those is the national champion of Haiti and will be competing in the Olympics.) And one was a refugee from the earthquake in Haiti two years ago, now living here in Oregon. We sat at a round table in a Vietnamese restaurant. French, Creole, and English languages whirled around along with the excellent food on the rotating tray in the center of the table. Naturally, the conversation turned to the devastation of the earthquake in Haiti and the continuing desperate conditions in a country which was already among the poorest in the world. When I asked the visitors about their impressions of the US, what seemed most surprising to them, apart from the cold weather, was how selfish we are. They expressed it much more tactfully, but what they observed is that we are not always quick to share what we have. In Haiti, people share naturally, generously, and frequently. It doesn’t matter how little you have; if someone needs something, you give it to them. They mentioned the example of phone minutes. In Haiti, pre-paid phone minutes are easily transferred from one phone to another. If someone needs minutes, someone else will simply send some over. Food, clothing, and other things are shared just as readily. In times of crisis, I think Americans are like that. We are quick to offer aid within our own borders and elsewhere when disaster strikes. I like to think that I am generous. But then, I am blessed with abundance unknown in much of the world, unknown in much of my own country, for that matter. Oh, there are lots of people with more than I have, but by the reckoning of a friend who considers everything beyond her basic needs as wealth, I am wealthy indeed. Why is it, then, that I sometimes get nervous about money? Not all the time. I generally live with financial confidence, but every now and then I feel a wave of uncertainty shift the sand under my feet and I start to fret. When John D. Rockefeller was asked how much more money he needed to be satisfied, he famously replied, “Just a little bit more.” As ridiculous as that sounds, considering his unprecedented wealth, sometimes I get it. Where does that anxiety come from, that fear that however much I have might not be enough? I have more money now than I did when I was younger, but the fear comes and goes in the same way. I have to conclude that the fear is unrelated to a particular dollar amount and will not be soothed by any specific increase in my bank account. Unlike sudden disasters, when the economy gets shaky, charitable giving goes down. Our tendency is to hold tighter to what we have, to circle the wagons with guns pointed outward, to bolt the doors, to look away from those in need. When the good times return, we give from our sense of abundance. What’s wrong with this picture? Let me stop here and say that I am not pointing fingers or trying to make anyone feel guilty or stingy. What I am really trying to do here is express curiosity about my own relationship with money. Why am I the way I am and not more like people in Haiti, for example? I’m not suggesting that I should go sell everything I have, as Jesus advised the rich young man, but perhaps I am suggesting that I could be a better steward of the abundant resources I have been blessed with. I could start by being more like the lilies of the field and give up worrying. How foolish I feel to worry when I am sitting in a house with indoor plumbing, full of food with a grocery store full of even more food just a few blocks away. I could keep my eyes and ears open for opportunities to share, to meet a need, to lend a hand, to offer comfort.